It's not every day that an instant classic is born. But when the box arrived in the mail, and I eagerly ripped it open, knowing that it contained Fresco's newest origin 100% bar, it was pretty evident that it was one of those rare days. I held off as long as I could to taste it; I inhaled it many times before the first bite ever left the bar, and I could tell that the deep, rich aroma was just a hint of the beauty and complexity that was soon to follow. I'll admit that there was a thrill of recognition and anticipation that greeted the first tastes of this chocolate; Fresco chocolate and I have a long and involved relationship now, and their chocolate is always of such consistent and fine quality that it's almost a no-brainer that I'm going to love it. Still, I tried to hold on to whatever objectivity I could as that first bite hit my tongue. That objectivity melted just about as quickly as the chocolate. I'd noted on the ingredients list that there was nothing but cocoa beans in this bar. No added cocoa butter. There was literally nothing standing between my taste buds and the beans, save for some expert and nuanced processing at the hands of master chocolate maker Rob Anderson, who very clearly has a gift. I've known this for some time, but even so was just flabbergasted at the smoothness and buttery texture he was able to achieve using nothing but beans. It's a little bit like the feeling I got when I descended the library steps at Trinity College in Dublin last summer, to find myself face-to-face with an illuminated page from the Book of Kells. It was astonishing in its complexity, beauty, and fineness, and that same thrill ran through me as the bite of Öko-Caribe began to melt on my tongue. A certain acidity greeted me head-on--not overwhelming, but definitely unapologetic. Notes of fig and molasses came soon afterward, and as the bar melted more, a lovely bready, buttermilk sourdough impression came through, and then a mellow gouda flavor. I suspect this would be an excellent chocolate to pair with smoked gouda. As the flavors mellowed out, a heady vanilla note sang through before fading back into the nuttier, cherrier notes towards the end. The last thing I remember tasting was my grandma's toast, all perfectly browned and buttered just the right amount. What remained in my head long after the final melt was something like a warm memory of everything beautiful from my childhood, combined with the memory of beginning to awaken to discovery and adventure. It's a powerful chocolate that can evoke those kinds of impressions. Keep in mind that all of this was achieved with zero sugar. This is about as pure as chocolate can possibly get. The chocolate maker isn't hiding behind additives or inclusions; instead, he is giving the gift of a chocolate exposed in all its natural glory, no embellishments needed. It's not an experience that everyone will enjoy, but just about anyone can appreciate the raw honesty and bravery that goes into the production of a bar like this. This is black-tie-and-standing-ovation chocolate, and I applaud it. I was lucky. On the day when the sky exploded for me and I suddenly became aware of the vast and incomprehensibly wonderful world of craft chocolate, I stumbled upon Fresco Chocolate, and what's more, I was able to meet and talk with Rob and Amy Anderson, the chocolate makers, personally about what makes their chocolate special. That conversation heralded the beginning of what, 3 years later, has become a consuming passion for me. It's what I learned about their chocolate that blew the lid off of fine chocolate for me, so that now, when I taste a new chocolate, I ask questions of it and want to understand it on levels that are really intimate and cut right to the heart of the maker's approach and style. This is what makes Fresco special: they take a batch of single origin beans and treat it in different ways (but using the exact same ingredients), arriving at completely different flavor profiles based solely on how that chocolate is roasted and conched, so that, say, the same batch of Papua New Guinea cacao results in a flight of 4 distinctly different bars: the light-roast, medium-conche bar will taste completely different than its light-roast, no-conche or dark-roast, medium-conche, or medium-roast, medium-conche counterparts. Tasting this chocolate feels a little like magic, a little like science, a little like research, and a whole lot like chocolate enlightenment. It's a peek into the mind of the chocolate maker himself. I've often said that Fresco's bar packaging is like a little interpretive museum exhibit: all of this information is included for the curious chocophiliac, and that makes Fresco pretty unique among bean-to-bar makers. It's a rarity for a maker to tell you how long he has roasted his beans, and even more so for him to divulge his conching time. But once one knows this about one brand of chocolate, it tends to make one curious about the others, and it gets one to thinking in different ways about all the other chocolates out there on the market. 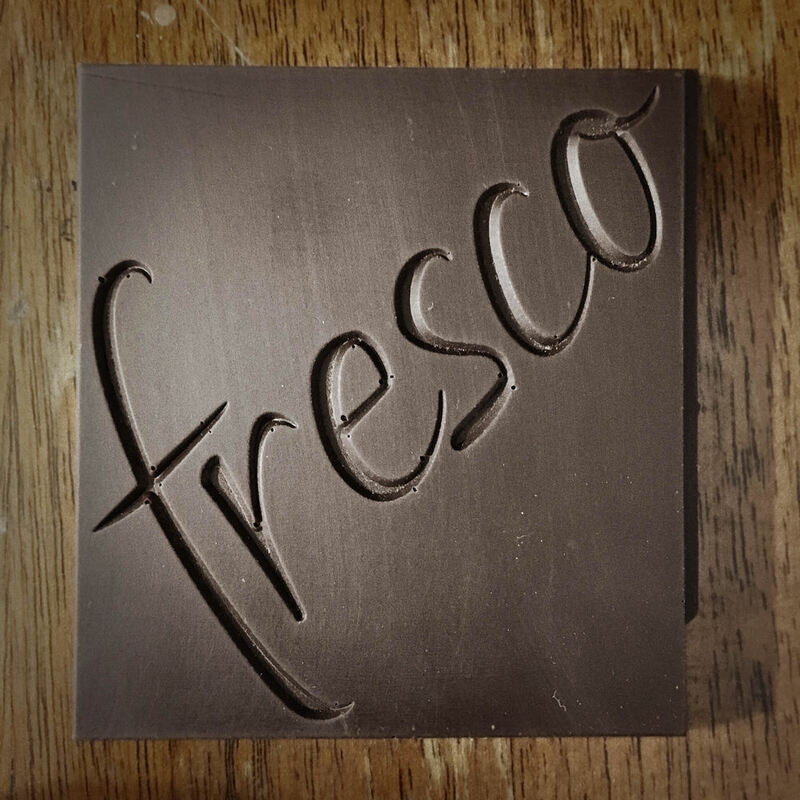 Fresco embodies and encourages transparency and accessibility, and in doing so, does an invaluable service to the education of all chocolate lovers everywhere. Follow Fresco on Facebook, Instagram, and Twitter.